Cast: Jim Brown, Tariq Nasheed, Killer Mike, Phil Valentine, Boyce Watkins, Patricia Newton, Llaila Afrika, Eric Sheppard, Jennifer Tosch, Anthony Browder, Robin Walker, Kaba Kamene, James Small, Nteri Nelson, Delbert Blair, Joycelyn Wilson. Sound Quality: 10/10. The audio was superb and top-notch. None of the voices echoed and I liked the few sound effects that were in the film. Cinematography: 10/10. This is a area of the Hidden Colors films where I've seen the most obvious progress from film-to-film. Lighting: 10/10. Much like the cinematography, the light quality has improved noticeably since HC1. Editing: 9/10. There are times when you can tell different parts of the interviews were cut out and placed elsewhere, but that's the nature of making a documentary. It doesn't take away from the film itself though. Scholars: 9/10. My only gripe is that I wish I could've seen more of the interviews. Maybe one day there will be a Director's Cut with extended comments by the scholars in the film. However in terms of the individual men and women...there is no complaint I have whatsoever. This review is split into a spoiler-free and spoiler section. The spoiler section is down below, but ALL of the spoilers aren't given. The documentary begins with a continued discussion about the Moors, a group of people who viewers have been enlightened about since Hidden Colors 1. The discussion centers around the impact the Moors had in Europe and how, as Robin Walker states, there were 150 Moorish castles all throughout Europe that became Christian castles as the Moors were driven out. 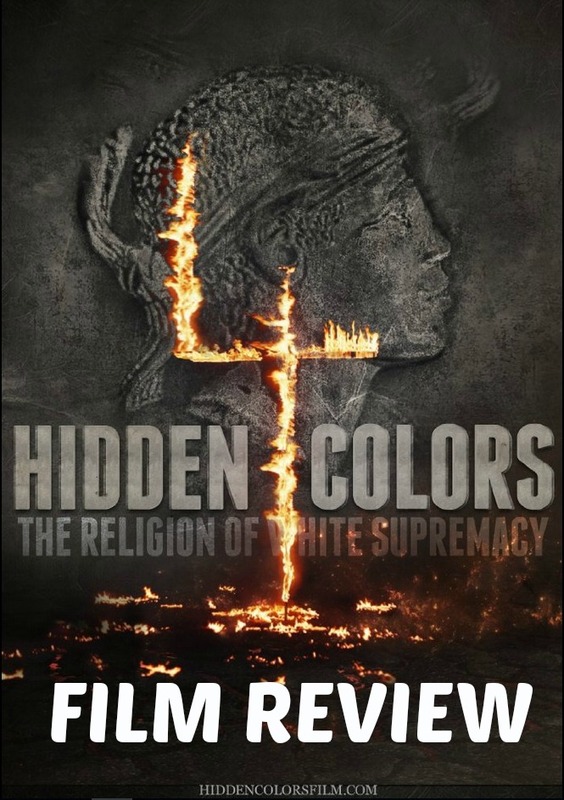 Much like Hidden Colors 3: The Rules of Racism being broken down into different rules that define racism, Hidden Colors 4 is broken down into the 7 commandments of white supremacy. I won't go over every little piece of information that's in the film, you have to buy it and soak up that knowledge for yourself. This is not just a review, but a sampling of what I believe to be the best Hidden Colors film to date. If you want to know about 3 of the 7 commandments, skip to the SPOILER section down below. If you want to know about ALL of the 7 commandments, skip down to the very bottom and purchase Hidden Colors 4 via Amazon. One of the reasons the Hidden Colors series has been so successful is because of how unapologetic it is with the information. We're in a time right now where we are being bombarded with propaganda via the mainstream media, via our mis-education system and via our government. People are hungry for real information without a filter and Hidden Colors 4 definitely provides that. If you liked the previous HC films, you'll like Hidden Colors 4. I've noticed how the HC series in general has been ignored by most mainstream outlets. One sure-fire way to tell if you're dealing with a platform that really cares about accurate information being put out there vs. politically-correct and often whitewashed information is whether or not they've reviewed any of the Hidden Colors films. Much of the information in these documentaries is hidden specifically because this society fights tooth and nail to not make their barbarism and human rights crimes against the Black population in America known and part of the official record. This is the real reason you get people who say "I don't want to talk about race." What they're REALLY saying is..."I don't want the dominant society held accountable for their human rights violations or even acknowledged publicly." This is the first commandment the film elaborates on and how Europeans have re-introduced some of the religious aspects of Islam, Christianity, etc into Africa among people who practiced versions of those religions already. Not only were these concepts re-introduced, but it was laced with racist propaganda. A great example of this is the myth of Ham's Curse which was used by Christians to legitimize the oppression of Africans by Europeans...just say that Blacks were cursed. They also talk about how Blacks seek to convert to religions to be more accepted by the oppressor, however the religion of the oppressor really isn't Christianity for instance. If it were then #1, we would be treated better but most importantly #2, the religion of the oppressor is white supremacy. This is why the Church is so segregated to this day. James Small dropped some heavy information about the similarities between the Genesis story and an Ancient Kemetian story found in what's called the 'Coffin Text' and the Book of the Dead. He ended his statement by powerfully saying that Christianity was a warmed over version of Kemetic theocracy. One of the things mentioned in this section was the fraud that is the Nefertiti bust. I've always believed that the Nefertiti bust, with its European features, was a fake. After watching Hidden Colors 4, I am now certain it's a forgery...which is not uncommon. There's always been a black market based around "ancient artifacts" where forgeries are sold for thousands of dollars to unsuspecting buyers. The Nefertiti bust however was modeled after a European woman, it was not constructed by Ancient Kemetians. The film also ties in the white-washing of Ancient Kemet which I wrote an entire lengthy blog article about several months ago. My blog entry is entitled, 'Were Ancient Egyptians Black? The Obsession with Whitewashing Ancient Kemet.' One can make an entire documentary just about this one topic as white supremacists have gone through hell for well over a century to deny the Blackness of the Ancient Kemetians. They do a very good job delving into this issue forcing viewers to do independent research to learn more. The documentary also delves into the West African empires such as the Mali Empire and Great Benin which is located in modern-day Nigeria. I also wrote recently about the Mali Empire and other Sudanic kingdoms of the Middle Ages in a blog entry entitled, 'The Roots Remake and Why Black America's Islamic Ancestry Has Been Hidden' and can be read (HERE). I haven't written about Great Benin yet, but know that the walls that surrounded the palace of the rulers of that civilization have been compared to the Great Wall of China and it's been suggested in Robin Walker's book 'When We Ruled' that in total, the wall may have been around 10,000 miles!! All of that was destroyed by the Europeans however out of hatred of Blacks and white supremacy. Put simply this commandment goes into the brutality and violence that is the religion of white supremacy. The first few minutes of this section can be found on Youtube actually. They mention the origins of the Hobo clown which comes out of the mockery of poor Blacks post-Civil War. Tariq Nasheed begins talking about the origin of the Battle Royale which saw young Black males as young as 3 years old being blindfolded and forced to beat each other into a bloody pulp just to receive a small "reward" that they could either spend on themselves or take home to their families that were poor. A disgusting a brutal practice that shows the level of disregard for Black people, but especially Black children. The most powerful part of this section was the discussion about the Black who fought back against white supremacy in the past, but their stories are never talked about because those in the dominant society want to continue to push this notion of Black capitulation and conciliation in the face of unlawful and undemocratic state violence. The best example I liked was the one about a group that formed after the Civil War known as the 'Black Shirts' who stood up to the Klan. When the KKK was marching on Beaufort, SC...an upstart and successful Black community, the Black Shirts went...armed...to the White part of town and told the White residents to get their KKK race soldiers or they'd get them! Without giving too much away, this is going to end the SPOILER section of this review.